University of Oklahoma expels two students and disbands Sigma Alpha Epsilon for racist slurs: The school should educate these students about the history of racism. Educate them. Show them what their words mean. The Sigma Alpha Epsilon fraternity at the University of Oklahoma in Norman, Oklahoma, March 9, 2015. Just two days after a student group released video of racist chants and songs from its members, the University of Oklahoma chapter of Sigma Alpha Epsilon is finished. 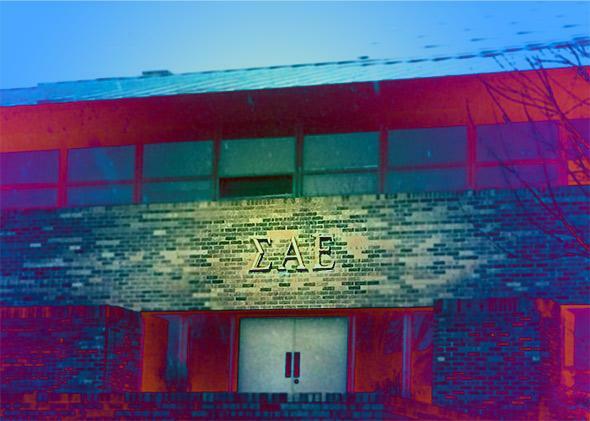 Not only has the school severed ties with the fraternity, it has closed its house, removed its Greek letters from public display, and expelled two of its members. What’s striking (and a little comic) about this incident is that it isn’t new. Across the country, colleges and universities have sanctioned Sigma Alpha Epsilon chapters for racism and explicit prejudice. In 1984, the University of Cincinnati suspended its chapter for two years after throwing a Martin Luther King “trash” party where members encouraged revelers to bring things such as a canceled welfare check, “your father if you know who he is,” and “a radio bigger than your head.” What’s more, the flier for the party was illustrated with a Ku Klux Klan hood and a portrait of James Earl Ray, King’s convicted assassin. In 2013, officials at Washington University in St. Louis suspended a chapter after pledges sang racial slurs at black students as part of a rush event, and last November, the University of Arizona suspended its chapter after members attacked Alpha Epsilon Pi, a Jewish fraternity. According to the local news report, one of the members—who got a black eye in the fight—“rounded up dozens of his fraternity brothers and went to an apartment where several AEPi members live, banged on the door and yelled racial slurs.” The next month, a chapter at Clemson University in South Carolina suspended its activities after members hosted a “Cripmas” party where they dressed in gang costumes and mimicked black stereotypes. Among young white male college students, he explains, this behavior isn’t unusual. “I have interviewed dozens and dozens and dozens of white men and have talked with them openly about issues of race,” he said, “Frequently the number one area that they talk about where they see race on campus is through racial joking patterns that occur in their primarily white friendship groups.” The “joke” framing is important: It allows participants to use racial language or express certain attitudes without acknowledging any personal prejudice. But let’s not pick on young white guys. As a whole, white millennials are far less racially tolerant than they think. “White millennials appear to be no less prejudiced than the rest of the white population,” explained political scientist Spencer Piston regarding an analysis of the 2012 American National Election Study. Likewise, while white millennials are more optimistic about race relations than their parents, they don’t score appreciably better on tests of implicit racial bias. White millennials aren’t less prejudiced. They just believe they are. And it gives psychic cover to the kind of behavior we saw at Sigma Alpha Epsilon. As far as the University of Oklahoma is concerned, I should say I’m not thrilled with the punishment. Disbanding the fraternity might be justified, but expelling students for hate speech is an extreme response that runs afoul of free-speech norms, if not the First Amendment. Education would be better. The University of Oklahoma is two hours away from Tulsa, which in 1921 was the site of one of the worst anti-black race riots in American history. More than a thousand whites stormed the black district of Tulsa and razed it to the ground, killing hundreds and leaving thousands homeless and destitute. Black Tulsa never recovered, but memories of the attack live on among descendants of the victims. Don’t expel the boys. Bring them to Tulsa. Have them see the memorials and talk to the children of survivors. Give them a chance to see what their words actually mean, and whether they want to be the kinds of people who sing about lynching for fun.